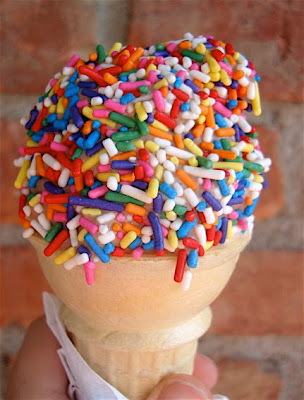 Vanilla soft serve ice cream with rainbow sprinkles! Apparently the only place in this podunk town that can make my wish a reality is Ryan's. The buffet place, and I really don't feel like paying for a buffet just to get an ice cream cone! Somehow no one in town carries rainbow sprinkles, how UN American of them! My friends keep suggesting I just buy sprinkles from WalMart and take them with me, but it's simply not the same!!! 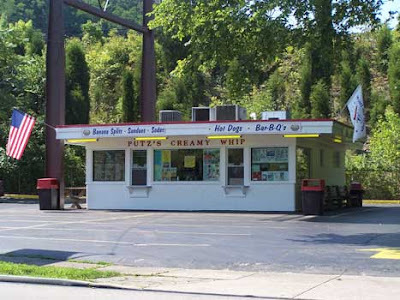 At the top of my to do list once I arrive in Cincinnati on Thursday is to hit up PUTZ's, the best ice cream joint in the world I've ever found! 1. The most expensive thing hanging in my closet is.....? 2. Have you ever played a team sport? Yes. Softball and Volleyball in high school and I miss it! 3. If you were a bug, what kind would you be? yuck! I'm stealing Sarah's answer, a butterfly! it's a short life, but at least people wouldn't run away from me or try to swat me with a flyswatter! 4. Where on your body is the worst place to get sunburned? My nose. It's the only place I ever get sunburn, so I wouldn't know if any other spot was worse. 6. People are always abbreviating..are there any abbreviations that make your skin crawl when people use them? 7. 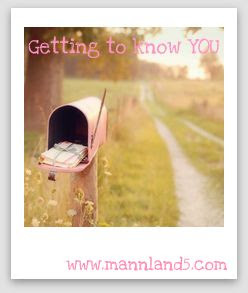 Do you love where you live..or could you live anywhere? We've made the best of it here, but now that our stuff is on it's way to Japan, I'm over it and ready to get out of small town, USA! I can live pretty much any where, it's the in between times, like right now, that get to me! 8. What, if any, extreme measures do you go to to keep yourself from overeating when you're full? I don't have a problem leaving food on my plate. I try to eat everything I put on my plate, but sometimes my eyes are bigger than my stomach and I'm ok walking away with out any extreme measures. OOH...ice cream sounds so good right now. I loved your answers for GTKY. I played softball and volleyball too! That icecream looks so good! I'm wishing that we had some in the house right now!